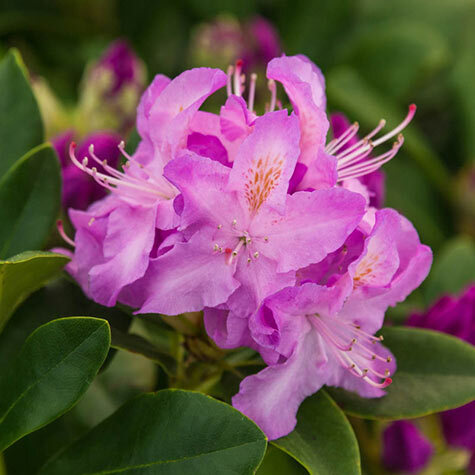 A gorgeous flowering shrub for a specimen plant, borders and hedges! In the springtime, clusters of funnel-shaped pink flowers with burgundy and tan hues open against the glossy, dark green foliage. 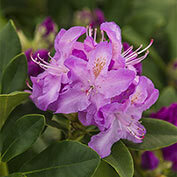 For best results, plant in well-drained, acidic soil in full sun to partial shade. Grows 6-10 ft. tall with a similar spread. Available in a gallon pot and shipping now. Potted. Zones 6-8. 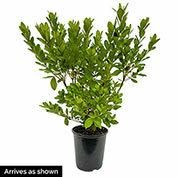 Foliage: Oblong, coarse, dark green, glossy, evergreen foliage. Flower Form: Open, funnel-shaped, pink flowers that bloom in trusses. Soil Requirements: Well-drained, moisture-retentive, organically rich, acidic soil. Pruning: After flowering, prune to shape and remove dead wood and broken branches. Deadhead flowers as they fade. Comments: Striking pink flowers make this a standout in the spring garden. Handsome, evergreen foliage keeps it attractive in every season, as a low hedge or a specimen plant. Grows in a dense, upright, spreading habit, wider than it is tall.